When The Sun Breathes Fire -- India's Death Wave — Saving Children In Poverty (SCIP) Inc. According to many scientific research and estimates, many parts of the South Asian continent, particularly India, would be uninhabitable by 2100 because of the scorching temperature. Ouch! Just the thought of a burning land where it is so hot that no human can survive peacefully is enough to make one sweat with fear. While we can think that the future is far away and it won’t affect us, let’s take a look at the now, the present. Every year, more than 100 people die in different states of India because of the heat wave. And when you think about heat, the only thing that can soothe you is water. No amount of sugar-laden cold drinks or mocktails can have that simplistic effect of water. It quenches thirst, while other drinks still make you feel like something’s missing. So it should come as a no surprise that water is a sought-after commodity during Summer, so much so that a woman from a Delhi slum lost her husband and son in a brawl with their neighbours, over water. Back in the SCIP Projects in Faridabad, the heat wave is tightening its grip too. So much so that sometimes, with all excitement in the world, we would set out to plan an activity like Yoga classes or Self-Defence classes for girls, only to realise the ground reality -- It is too hot to do anything. When the temperature soars to 45 to 47C, no fan can soothe you. Our Volunteer, Kranti Bandhu, visited Neetu, one of the women who work at SCIP SEWS. 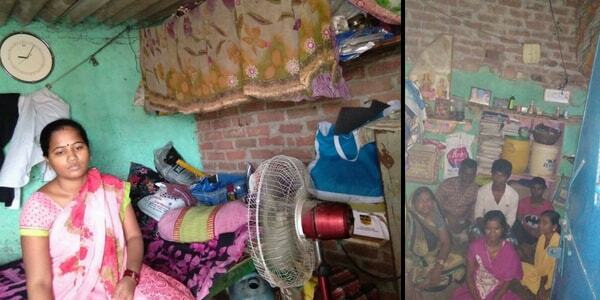 Neetu lives with her family in a tiny room, such that we can even call it a shed made of cement. All they have is a small fan. And a family cramped into that small space. At SCIP SEWS, a non-profit organisation, it is our sincere efforts to build a decent infrastructure such that the women can work peacefully, without having to worry about the sun’s fury. Please help us build infrastructure at SCIP SEWS so that these women can support their families financially and even their loved ones can escape from the deathly grips of the heat wave.